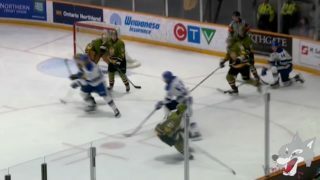 Toronto, ON – The Ontario Hockey League today announced that Buffalo Sabres prospect Ukko-Pekka Luukkonen of the Sudbury Wolves is the OHL ‘On the Run’ Player of the Week for the regular season week ending October 7 posting a 3-0-0-0 record with a goals-against-average of 1.66 and save percentage of .952. 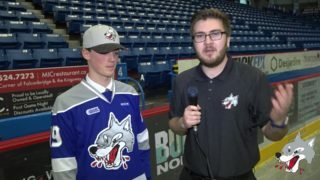 Luukkonen turned aside 99 shots in a trio of road games last week for the Wolves who are now winners of five straight with him in the crease and sit atop the league’s overall standings with 12 points. 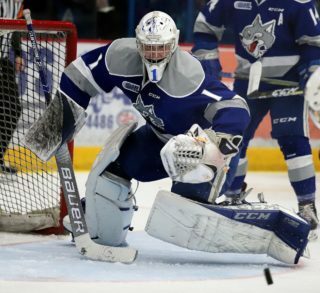 On Thursday night Luukkonen had a first star performance between-the-pipes with a season-high 46 saves in a 3-2 win over the Niagara IceDogs. 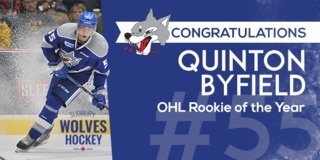 He made 23 saves as part of a 4-1 victory over the Erie Otters on Friday night, then wrapped up the road trip with 30 stops in a 3-2 overtime triumph against the Kitchener Rangers on Sunday afternoon. A 19-year-old from Espoo, Finland, Luukkonen was chosen third overall by the Wolves in the CHL Import Draft and marks the first European goaltender to be selected since 2013. His perfect start has situated him among the league’s goaltending leaders with a goals-against-average of 1.78 and save percentage of .944 while his five wins are a top mark. The Sabres picked Luukkonen in the second round of the 2017 NHL Draft and signed him to an entry-level contract in June. 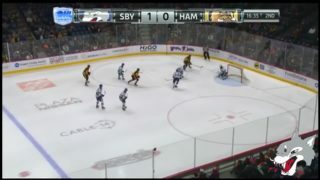 Watch video highlights of Luukkonen and the Wolves against the IceDogs, Otters, and Rangers. 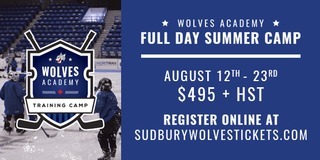 Also considered for the award this week were Guelph Storm forwards Isaac Ratcliffe (Philadelphia Flyers) and Nate Schnarr (Arizona Coyotes) who both scored three goals with two assists for five points in a pair of weekend wins. Joseph Garreffa of the Kitchener Rangers and Austen Keating of the Ottawa 67’s each had six points in three games with Garreffa tallying two goals and four assists to Keating’s one goal and five assists.